Origin: I’m pretty sure The Numbers Game came to my attention via Amazon’s recommendation engine. I’ve already read Soccernomics, and Inverting the Pyramid, two classics of soccer writing, and the teaser for this one was irresistible. Summary: In The Numbers Game, Anderson and Sally deconstruct the beautiful game and somehow make it even more beautiful. They take on sacred cows and turn them into ground chuck with exhaustively researched and meticulously calculated evidence. Along the way we learn about the O-Ring Theory of Economic Development and its implications for soccer. We learn about coaching and team dynamics and why the outcome is impacted more by the weakest player on the team than by the superstar. We learn why, if the number-crunchers have their way, you might be cheering in a few years when your side pays an enormous sum of money for a defender, and why you should be thankful that they don’t sack the manager after a handful of bad performances. My Take: I loved it – especially the part about the whole damn thing. But especially the team dynamics, weakest-link, O-Ring stuff. 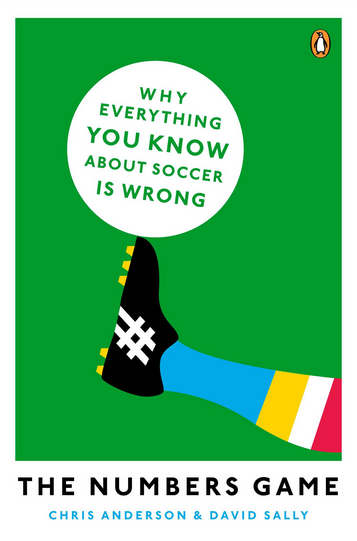 Read This Book If: …you’re into soccer (especially if you want to pick arguments with folks who think they know about it) or the power of analytics, really. How do you solve a weakest link? I love it when my own suspicions are confirmed (in this case by detailed analysis of the impact of sequential goals), p101: “Strikers who score the key goals, the ones that can be directly translated into more wins and more points, are worth rather more than the flat-track bullies who appear to rub salt into wounds, scoring the third and fourth goals as victory turns into a drubbing. Simply counting strikes can be deceiving: one goal is not the same as the other.” But why does this matter? Well, the weighted list of top scorers by impact is different than the simple list of top scorers; teams that recognize this can exploit inefficiencies in the transfer market. p201 introduces “The O-Ring Theory of Economic Development”, and subsequent pages make the case that soccer is a good sporting parallel. p209: Have you heard of the Zidane Clustering Theorem? Do you coach something? Then you should understand the Köhler effect, which is explained on p241. In the margins of page 287 I noted that one thing absolutely everyone needs to understand (and especially if you’re in a leadership role or involved in athletics) is the concept of regression to the mean. Do yourself a favour and click on that link if you don’t know what it is.